In Farmington, Kansas, a town just outside of Smallville, a string of strange incidents draws in Superman, J'onn J'onnz, and Batman to investigate. According to witnesses, a boy has been walking around, screaming to be left alone, and then... boom! Massive energy from the boy destroys everything in his wake. So far, a high school football field, a hospital, and a house have all been victimized. 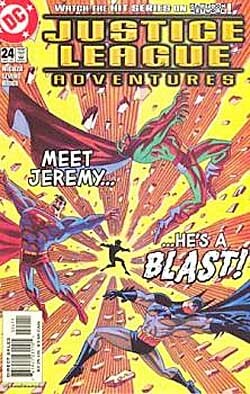 Batman soon ties the pieces together, informing Superman and J'onn J'onnz that the one responsible is a twelve-year-old boy named Jeremy Newell. The first incident occurred at Jeremy's house, where his parents were injured in the explosion. The next incident happened at the hospital holding Jeremy's parents, and the third and most recent at the high school football field where Jeremy played defensive back for the team. The three Leaguers are conflicted on how to proceed from here. Batman seeks justice, J'onn Jonnz sympathizes with the boy's alienation, and Superman is stuck in the middle: the disasters are hitting a little too close to home for him to be as sympathetic as J'onn, but he can certainly empathize with the situation; he was once also a teenager with powers he had difficulty controlling. When the Leaguers finally find the boy, they attempt to help, but a strange multicolored vortex around him sends the heroes sprawling. They finally learn that Jeremy is not really responsible for the damage that has been done; an alien force claiming to be the boy's true family has struggled to reclaim him, agitating Jeremy so potently that his powers have lost their focus and control. Finally, the Leaguers reason with the alien force, giving it a glimpse of Jeremy's human life that serves to sober the angry phenomena and leave Jeremy to continue his life on Earth, pausing only to help heal his wounded Earth-parents before leaving. Story - 2: I see where the writer was trying to go in this issue, but I felt he ultimately fell short. What could have been a truly engaging, character-driven tale turned instead into a less than mediocre disappointment. Superman, J'onn J'onnz, and Batman had the beginnings of characterization, with each hero having a slightly different take on the situation, but the stakes never felt very high; Jeremy's parents were injured, not dead, and besides a lot of property damage, no other real harm was done. Thus, Batman's motivation was really lacking. He wanted justice? For what? And what kind of justice? Meanwhile, Superman, who should have been the most sympathetic, wavered around without ever coming to a firm judgment on the situation. J'onn J'onnz, meanwhile, was the most empathetic despite the fact that his own background was never anything like Jeremy's. The plot was spread too thin and the characterization was too shallow to develop into anything substantial. Art - 3: I'm familiar with Tim Levins' work from his run on Batman: Gotham Adventures and my one gripe with him then is the same as it is now: his pencils take up too much space. While this wasn't the most intricate story, it might have been helped by an artistic effort that was paced out a little better. This might be the writer's fault, and what he called for in the script, but knowing what I do about Levins' style, I have a feeling it rests significantly on him. Further, while the characters are all well-rendered, no one scene stands out as particularly potent and the alien being a blob of color certainly makes things easy for him. Cover Art - 2: Yuck. I don't know what it is about Butch's covers, but I (for the most part) really don't like them. The characters are always very blocky and unrealistic looking, the colors are horrendous, and there's never anything particularly original about them. The saving graces of this cover (what prevents it getting a 1) are J'onn J'onnz and the way the heroes are all falling at us in different directions.